The GHC-530 automatically cuts elastic, webbing (up to 1/4-inch thick), ribbons, belt loops, Velcro, nylon cords, leather, safety belts, rubber and tapes to desired lengths. Hot version seals edges of synthetic materials to prevent fraying. 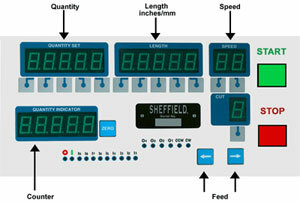 A pneumatic or "Air" version of this machine is also available which features variable dwell time. 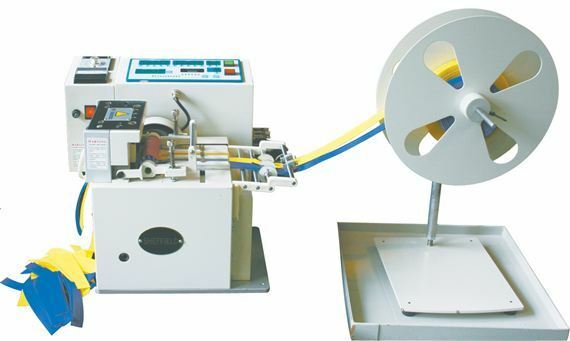 The GHC-530 is a hot and cold electronic piece cutting machine with adjustable speed, very user friendly and completely automatic. It is designed to operate without the constant attention of an operator. It will cut and count up to 99,999 pieces, automatically, and stops on any count that you set. The two sensors will stop the machine when the roll ends and will keep in memory the amount cut until that point. It is able to cut in inches (1/32 increments) or millimeters (1 mm increments). It also has a multi-stroke feature. If the material you are cutting is very thick, it can be programmed for the knife to come down multi-times (0-9) without advancing the material. The hot knife has a temperature control up to 600 degrees and is self adjusting. The heating element has a sensor that regulates and balances the heat to within 10 degrees of the set value. The GHC-530 is self diagnostic. It can trouble shoot its own problems. The machine comes with its own tool box that holds a set of cold blades, tools, manual and one adjustable tape rack. Safety Handle. Heat resistant handle on the safety cover makes it safer and easier to remove the cover. Alarm will sound to alert operator when the following occurs. B) The knife safety cover is removed. When the GHC-530 is set up on the hot knife system. If the operator forgets to turn off the machine at the end of the day, the machine will automatically shut the power off to the heater control box this will increase safety and reduce costs, by prolonging the life of the heating elements and also lowering energy consumption. Dimensions 20" x 18" x 18"